Happy Post-Turkey Day festivities! We hope you’re reading this as you sit stuffed to the gills, a little buzzed, and surrounded by family and friends. We also hope that this installment of Our Blog gets to you in time! With the Black Friday shopping cycle getting longer each year, it is quite possible that our words of wisdom might reach you too late! So let’s get into it. Black Friday is kind of a special day around 7Spears. It usually falls on the birthday of our Director of Operations, Jenny. If you know anything about Jenny, you know that it takes a feat of amazing grit, courage, and stamina for her to pass up a good sale. That usually means that we are out-and-about at o-dark-thirty the morning after Thanksgiving. Skip it. If at all possible, stay at home that day. Enjoy a leftover, tryptophan-induced coma. Play a pick-up game of touch football with the neighborhood kids. Go to the range. Do ANYTHING but be around the madness that is ensuing at your local mercantile establishments. Later that evening, you can sit confidently in your Lazy-Boy watching some tragedy unfold on the nightly news at some major box store, knowing that Darwinism has reared its ugly head yet again and the worst of humanity has jumped head first into the holiday season. Then, on Monday, wake up, grab your coffee, shuffle over to your computer in your robe and slippers, and find a Cyber Monday deal that puts the Black Friday deals to shame. Seriously folks, avoid the risk if at all possible. #1: More people visit Walmart on the Friday after Thanksgiving than visit Disneyland all year. #2: More people die every year in Black Friday shopping tragedies than in shark attacks. Put your phone away and pay attention. Situational awareness is key here people, especially if you are knowingly entering a powder keg environment waiting for a fuse. Give yourself (through your senses and attention) the fighting chance to recognize a threatening situation and avoid it before you inadvertently get caught up in it. We talked about intuition a little bit in our second installment of Holiday Travel Safety and Security, but it’s worth repeating here; Trust Your Instincts! If something doesn’t feel right, if you see something that doesn’t look right, if you have a weird feeling, just leave. Immediately. The bargain isn’t worth the danger your body is screaming at you to avoid. Feel silly later, but be alive to feel it. Patience, patience, patience. Unfortunately, not everyone reads 7Spears’ Blog Posts (we’re working on that!). Most of the people you run into will be distracted in their phones, sleep deprived, and sale crazed. As hard as it is to understand, their very life in that moment relies on them getting the latest Tickle Me Elmo at a $5 discount. They may or may not notice you. They may or may not care. They may or may not have had their coffee yet and could be the Devil incarnate. You and your plans are nowhere near as important as them and theirs. This is true on the road, in the parking lot, and in the store. So BREATHE, and practice your “Wooo-Saaaa.” Yes, coffee helps too. Have a plan. You are a true glutton for punishment if you go out on Black Friday just to “meander around and see what sales are available.” You are obviously out there for a reason. Stick to that reason, get in, and get out. Pre-plan your routes, plan your stores, and have a specific shopping list. Be familiar with the stores you will be visiting. If you have never been there before, visit them before Black Friday, and before the mobs. Identify emergency exits and “pockets” of the store that can be used to get out of the mob: restrooms, mall alcoves, an unused section of the store (the garden area in big box stores is usually pretty vacant during Black Friday), etc. • Leave kids at home with family or a sitter. You’ll have enough to worry about keeping an eye on yourself and everyone else. You don’t need the added responsibility of little ones. In an unruly mob situation, kids are especially vulnerable. Not to mention the abduction risks. Hey, you’re probably out there shopping for them anyway, right? Let them sleep in while you voluntarily risk your life. Carry only the necessary cash (very little) and only 1 or 2 credit cards. Incidents of theft and robbery are 28% higher on Black Friday than any other day of the year. Limit your exposure to loss. Leave the purse/wallet at home and carry only what cash, ID and credit/debit cards you need in a waist pouch (you can bedazzle your fanny pack in a festive Christmas motif to make it seem less awkward!). Park under lights and close to entrances. If you wait until daylight to go Black Friday shopping, you are likely late to the party and picking up scraps (literally!). So it is probable that you will be out in the dark hours of the early morning. We have already talked about the steep increase in incidents of theft and robbery, this especially applies to you around your car and the items you have in your car. The bad guys know that everyone is out-and-about loading up their vehicles with high-end electronics, jewelry, clothing, etc. They sweep in like Dr. Seuss’ Grinch to take advantage. Parking close to entrances and in a well-lit area makes you a harder (not impervious) target. Park smart, keep your wits and senses about you, lock your doors, have your keys out when you return. As you get back to load your car up, take a moment before you open up your vehicle. Look at who/what is parked around you. Look behind you. Make eye contact with anyone loitering in the area. Again, trust your gut and if it doesn’t feel right, go back into the store. Lose your ego. NO bargain is worth a confrontation. People will be aggressive. People will be rude. People will be entitled. People will be impatient. Know this before you leave the house. When you encounter this (and you WILL), go to your happy place, smile, and practice your best, “I wish you a Merry Christmas.” When all else fails, turn and walk away. Let it go and know that Santa is delivering an extra helping of coal to their house. Ready? Now you are. Keep your wits about you, trust your instincts, stay situationally aware, and practice the Holiday Spirit. Have a plan and stick to it. You’ll be fine. 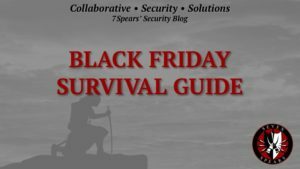 We were going to include a holiday shopping list for your favorite security professional in this post, but we decided to delay that…we don’t want to be responsible for you going out on Black Friday to get our gift! Enjoy the day, stay safe!